The handles are molded from an RTP 200 Series nylon 6/6 specialty compound reinforced with glass fiber. 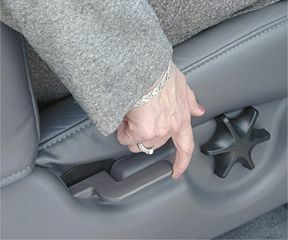 The multiple components meet a critical color match with the adjacent plastic parts on the vehicle’s seat. Current colors are Dark Prairie Tan, Dark Graphite, and Medium Tan. Porter Engineered Systems, Inc., has provided mechanical seating and steering column adjustment systems to the automotive OEM and after-market since 1977. Contact them at (248) 799-9070 or visit their website at www.porteres.com. Global Plastics, Inc., offers rapid tooling, engineering, molding, and assembly in products from small prototypes to high volumes. Contact them at (317) 872-2345 or visit their website at www.global-plastics.com.